* In this photo Claire and Mitch and Dean sit patiently during a ceremony that marked the Victory on Genocide Day, January 7th. 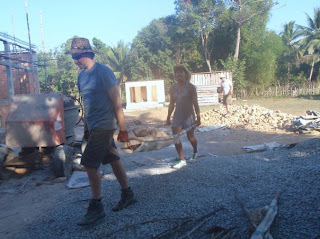 * Kent and Toly carry large rocks on make-shift stretchers. The rocks will be used to fill up the floor before it is smashed down and smoothed out with cement. 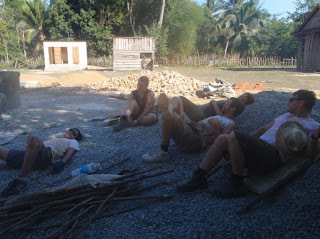 *Working on the construction site can be extremely tiring, especially when the temperature reaches 35degrees and more! Here some volunteers lay on a pile of gravel for a well earned rest. 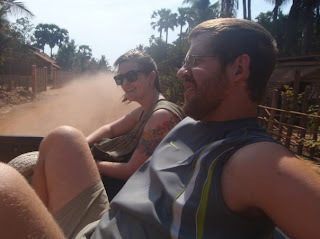 * Lucy and Pete sit in the back of a ute as they travel to the village. 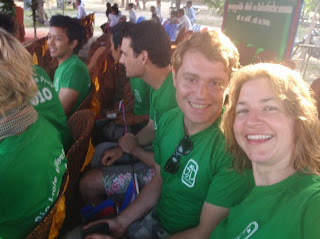 * During the project volunteers have the opportunity to explore Cambodia. 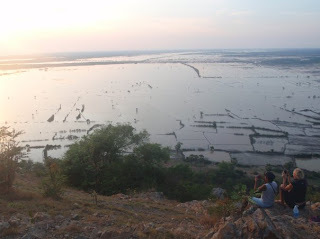 Here two volunteers watch a sunrise along the lakes near the Angkor ruins. Its pretty spectacular.